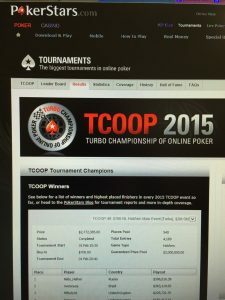 In an age when the Chris Moneymakers of this world seem to be losing traction as the more experienced pros re-establish their poker tournament prowess, a virtually unknown amateur, Jamie Geffin (aka PitBully01), a 23-year-old portfolio manager from London, took down third in a recent PokerStars Turbo Championship of Online Poker (TCOOP) NLH event. 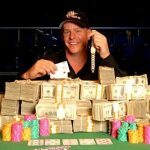 Raking in a massive win of almost a quarter million dollars, Geffin seemed like a good mind to probe for how other amateurs can approach today’s hard-to-beat online poker scene. CardsChat News Editor-in-Chief Hannah Elisabeth (CC) spoke exclusively to Geffin (JG) about how he prepared for the event, what he plans to do with his windfall, and what advice he can offer to other neophyte players like himself. CC: Can you tell us a little bit about yourself outside of poker? JG: I am currently single and 23. I work in wealth management as a portfolio manager for dual-national US citizens. [My] hobbies are poker and boxing (a strange mix, I know). CC: What got you interested in poker and how long have you been playing? JG: Love of cards, math, logic, and [the] strategy behind the game. I have been playing since I was 13 [or] 14, and had a natural flare for the game and haven’t stopped playing since. CC: Do you study strategy in books, did friends coach you, or both? How did you develop your playing skills? JG: I have read about poker while studying mathematics at university. I don’t believe that the best poker players can do it all from the books. A lot is reading all different situations and [studying] human behavior. I learned all my poker [skills] from playing with friends and in recent years [with strangers] at casinos and online. CC: You just took third in a major PokerStars tournament. Can you tell us how many such tournaments you had played prior to this, and what kind of track record you had before this massive win [$228,721]? JG: The realization is still sinking in. 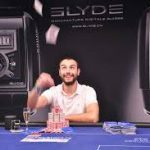 I have had my biggest wins from playing live cash games (which I think helped massively with these turbo-based tournaments). I have played these types of tournaments [before] and have cashed out in a handful. I normally try to win my way in by playing satellites and having the patience to wait for the right hands. CC: Let’s discuss the tournament itself. There were 4169 entrants, that’s a huge field to beat! What was your strategy going in? How long did the event take from start to finish? JG: It was roughly 5 to 6 hours of long [play]. The 20k [chip] starting stack soon became small as blinds increased every 5 minutes. In these “mega” events, I try to stick to the “patient” approach and only play the strong hands. It may be a cliché, but a chip and a [chair] couldn’t be [a more important outlook] in these tournaments. CC: Can you tell us about some of the more pivotal hands? For example, did you make a key bluff that added to your stacks? Or play a made hand brilliantly? JG: Unfortunately, [there were] no real big bluffs. I feel I played my position/s on the table incredibly well. I won 17 out of 19 showdowns, and 22 hands without a showdown. I feel this shows that I was fairly tight (and had a bit of luck) on my side. CC: Did you come up against any known pros in this event? Was it intimidating? JG: I kept my eye on the 7 or 8 pros that entered and luckily never crossed [my] path. I was hoping to sit on a table with Liv Boeree. I did [once] play against Jake Cody in a previous tournament, but luckily someone else managed to do the dirty work for me. CC: During an online event, do you keep the chat function on or do you prefer total silence? What about player tracking software, do you use any of the software that helps you analyze other players’ moves? If so, do you find it significantly helpful? JG: I keep [chat] on, but very rarely get involved [with it]. I like looking at the stats. A few hands when I had to shove, I was running down my time clock hoping to get to the next pay brackets. I like to pay attention to my table and keep track of the players from memory. I can still remember plays from early on in the tournaments that help making decisions when I cross paths with the same players later on. I may look into buying software packages. 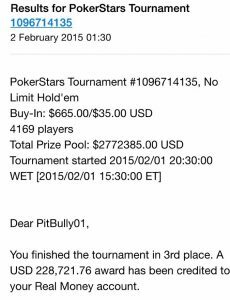 CC: You took third in this event for just shy of $230,000. That’s a lot of money. Do you have to pay taxes on it? What do you plan to do with your winnings? JG: [It’s] a lot of money indeed. I’ve been looking to buy a property, so this will definitely help, especially it being 100% tax-free. Some will be used for future investment [or] bankroll into some more tournaments. CC: What’s next in your budding poker career? 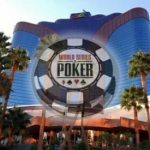 Do plan to play more online events, venture into the WSOP this summer in Las Vegas, or any other poker dreams you plan to pursue? JG: I will continue to play as I do. My dream has always been to enter the WSOP. Now it is a dream that could be very likely. I am going to try to win a seat into the EPT tour in Monte Carlo. 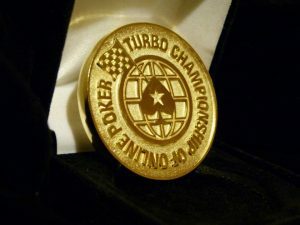 I enjoy live poker, so [that would] be a nice tournament to play in.